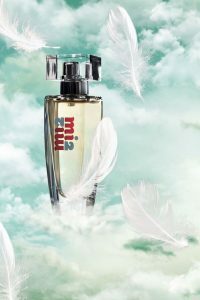 Welcome and thank you for your interest in the niche perfume mi2 – a fragrance to introduce the topic of angels! As a Berlin-based perfume designer, trained in Grasse, it is my true passion to create one of a kind perfumes in my Parfumatelier for fragrance enthusiastic ladies and gentlemen, that are as unique as a signature. The creation of customized, individual scents opens up life stories, memories, deep desires, a search for emotional expression. This special and valuable work led me to develop my very own perfume brand. A brand that is more than a product. With dedication the development time from the idea until the launch date was four and a half years. From the call of my heart and my inner ambition arose the desire to establish a scent venture that goes beyond fragrance and unfolds a higher meaning. The backdrop to the development of mi2 originates from my clear, personal connection and experience with heavenly creative forces, the angels, who bridge the gap between heaven and earth and are all too happy to become engaged. Thus, I decided to follow the call of the angels to give them a voice through the language of perfumery and so make them come alive. This fragrance, if you will, is created and inspired by angels to unite and bestow people with love. to diffuse your heart’s power into this world!